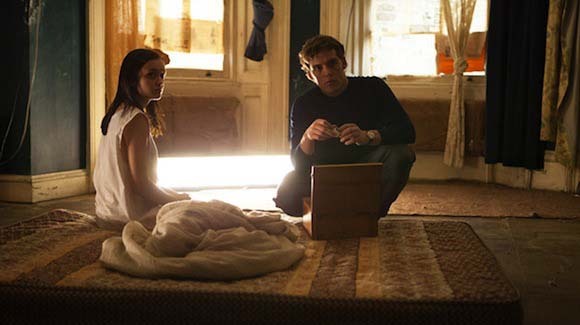 The Quiet Ones (15) is the latest spine-tingling tale from Hammer Films. What’s It About? Inspired by true events, the film tells the story of a professor (Jared Harris) who performs a series of experiments on a young patient (Olivia Cooke) to push her to the brink of insanity in order to test his theory that you can create a poltergeist from negative energy. believes that everything has a rational explanation, including the appearance of demonic possession. Coupland takes on four of his students; confident and sassy Krissi (Erin Richards), her joker boyfriend Harry (Rory Fleck-Byrne), and shy, unassuming Brian (Sam Claflin), alongside a mentally disturbed girl, Jane (Cooke), to test his theory. The experiment involves driving Jane to the brink of insanity in order to summon the negative brain energy out of her and into an inanimate object, curing her of her apparent demonic possession. However, as time passes Jane’s state only appears to gets worse, and with demonic etchings suddenly being burned into her skin and Krissi’s life coming under threat, the students begin to think there’s something supernatural going on after all. Coupland stubbornly refuses to accept the possibility of his hypothesis being wrong, leading to friction forming among the group and putting all of their lives in danger. With its setting in the 70s, The Quiet Ones is immediately eye-catching with its retro feel that will appeal to fans of horror classics such as The Exorcist and The Omen. Claflin’s character, Brian, also serves as the cameraman for the experiment and the film flits between regular filming and Brian’s shaky, grainy, handheld camerawork. As a viewer you’re thrust right into the middle of the experiment and experience the same terrifying perspective as the students. Most of the horror comes from the tension of not knowing what is going to happen next which makes for creepy, edge-of-your-seat viewing rather than scream-inducing terror. Cooke gives a stand-out performance as the disturbed Jane, confusing the audience into whether they should be scared of her or pity her and often achieving both. The rest of the characters are also well-rounded and integral to the plot with their presence adding elements of reassurance and normality to the film, with scary scenes neatly embedded among everyday conversations between the group. In a way, you start to look forward to the scenes where all the characters are together as you feel a sense of unity with the students who are just as confused, scared and freaked out as you are. The Quiet Ones is strong from the offset and only gets stronger as the film progresses, however parts of the conclusion feel a little rushed with the revelation about Jane’s character being glossed over to make way for the film’s grand finale. Although the finale is still effective, it probably would have a stronger impact if the audience weren’t still trying to process and get their head around the previous scene. Final Words: The Quiet Ones is an innovative and intriguing new horror film that will have you on the edge-of-your-seat throughout. Even if you’re made of stronger stuff and the scares don’t impact you, you’ll still be able to enjoy the story and the characters as, unlike many recent horror films, The Quiet Ones doesn’t depend on the horror to make the film. The Quiet Ones is in UK cinemas from 10 April 2014. A film and showbiz journalist. Find me on Twitter @StephanieRiou !